Sinful Colors Cinderella had been on my wish list for a while but it took me loads of visits to Boots (and the fact that there's only 1 in Northern Ireland selling them (Donegall Place) makes it a bit of a pain) to find it. I have used it once before as undies not realising it itself needed undies, in this case a bit of white polish to hide the nail line. A very soft pastel blue with a pink shimmer through it. I popped Sinful Colors Hottie on to my ring and thumb for good measure (this looks like a dupe of OPI - Last Friday Night from the Katy Perry collection). 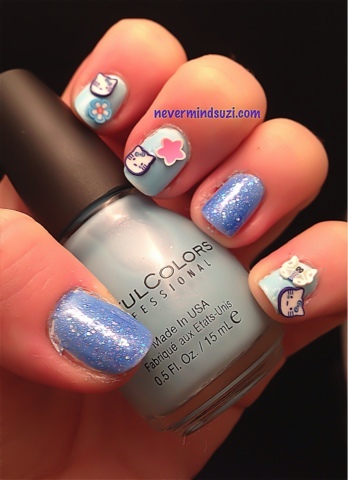 Then I was in a Kitty mood and added these lovely fimo slices from Treasures By Tan. 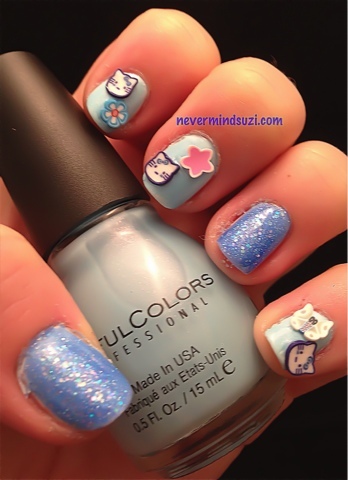 A pretty pastel kitty mani. 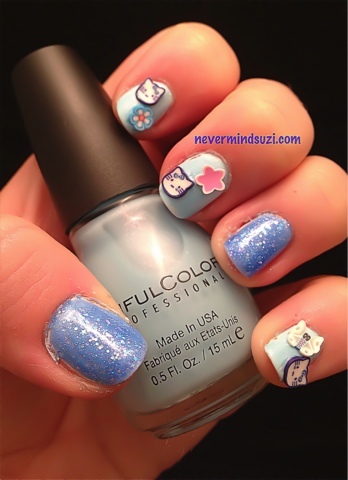 I absolutely adore everything about this mani!!! Cinderella is a beautiful color choice. As well as Hottie.